James Madison was the fourth President of the United States. Madison was born in 1751 near modern-day Port Conway, Virginia, and lived with his family at Montpelier, the Madison family estate. Madison received extensive schooling and graduated from the College of New Jersey (now Princeton University) in 1771. Following graduation, Madison returned to Virginia. He embarked on a career in politics and supported the patriot cause in the American Revolution. He served as a member of the Orange County, Virginia, Committee of Safety, a patriot organization, and, in 1776, participated in Virginia's first state constitutional convention. In 1779, Virginia selected Madison to represent the new state in the Continental Congress. During these years, Madison became good friends with Thomas Jefferson. Like Jefferson, Madison committed himself to securing religious freedom for his fellow Virginians. Elected to the Virginia legislature in 1784, Madison helped Jefferson protect religious freedom in Virginia in 1786. Madison also played an important role in the creation of the United States Constitution. He opposed the weak federal government that the Articles of Confederation of 1783 had created. He believed that the Articles could not meet the needs of a newly independent United States believing the young country needed a strong government that had power to protect its citizens, including the power to tax. In 1787, Madison represented Virginia at the Constitutional Convention in Philadelphia, Pennsylvania. He advocated a strong federal government consisting of a two-house legislature. The population of the respective states would determine the number of representatives each state would have in this congress. Most states with larger populations favored this plan, but states with smaller populations called for equal representation in the legislature. The convention fashioned a compromise. In the House of Representatives, population would determine representation. In the Senate, each state would have equal representation with two senators each. The Convention delegates also created two additional branches of government: the executive and the judicial. Each branch had checks on the powers of the others to prevent one group or one person from dominating the government. Once the Constitutional Convention approved the Constitution, Madison had a leading role in convincing the individual states to accept the new government. With John Jay and Alexander Hamilton, Madison published articles, now known as the Federalist Papers, which advocated the Constitution's adoption. In 1788, Madison served in Virginia's ratification convention, where he convinced his fellow delegates to accept the stronger federal government. In 1789, his constituents elected him to the first of four consecutive terms to the United States House of Representatives. In Congress, Madison favored the Federalist Party's platform at first. He supported tariffs (taxes on foreign goods imported into the United States) to eliminate the national debt. This was a Federalist policy. Madison, however, began to grow disenchanted with the Federalists. He opposed the creation of the Bank of the United States because he feared too much government interference in the economy. He also introduced several amendments to the Constitution to protect the rights of both the people and the states from federal government actions. These proposals formed the basis of the Bill of Rights. By the end of his service in the House of Representatives, Madison firmly supported the Democratic-Republican Party's agenda. In 1797, Madison retired from the House of Representatives and returned to his home in Virginia. For the next two years, he engaged in agricultural pursuits, but he returned to politics in 1799 as a member of the Virginia legislature. In 1801, Thomas Jefferson became President and appointed James Madison to be his Secretary of State. As Secretary of State, Madison dealt with the conflicts between England and France. These two nations had been at war with each other almost continuously since the 1680s. Jefferson and Madison, although they were Democratic-Republicans and favored the French, hoped to remain neutral. Both Great Britain and France kidnapped U.S. sailors and illegally seized cargoes of U.S. ships. At this point in history, the United States did not have a military force capable of preventing such actions. Instead, Jefferson tried to hurt Great Britain and France economically with the Embargo Act of 1807. Under this act, the United States cut off all trade with the rest of the world. In 1808, Jefferson chose not to run for reelection as President. Madison, running for the Democratic-Republican Party, easily defeated Charles Cotesworth Pinckney, the Federalist candidate. The tensions between Great Britain and France dominated Madison's administration. Realizing that the Embargo Act severely hurt the United States' economy, Madison reestablished trade with all nations except England and France in 1809. This action did not dramatically improve the plight of people in the U.S. because most sold their products to these two countries. In 1810, the Macon's Bill Number 2 lifted the embargo on England and France but stated that if either nation recognized U.S. neutrality, the United States would cut off all trade with the other country. In November 1810, the French attempted to convince the United States to cut off trade with Great Britain by promising to respect the neutrality of American ships. Although President Madison did not trust the French promise, Great Britain took further offense at both France and the United States. In 1812, Madison asked for a declaration of war against England. The main reasons for Madison's action included England's impressment (kidnapping) of U.S. sailors and Great Britain's seizure of U.S. goods. England's trade with American Indians also concerned Madison as the British traded guns in exchange for furs. The British hoped that a well-armed American Indian population could prevent further territorial expansion of the United States. American Indians used British weapons to slow U.S. westward expansion, which made life especially dangerous for white settlers living on the frontier, including people in Ohio. On June 18, 1812, Madison signed a declaration of war, officially beginning the War of 1812. Although the United States did not have a strong military during the War of 1812, U.S. forces fought quite well on many occasions. By December 1814, both Great Britain and the United States realized that neither side was close to victory. Rather than continuing the fight, they agreed to try and settle their differences at the peace table. In December 1814, both sides agreed to the Treaty of Ghent, which stated that both nations kept the land they had owned prior to the War of 1812. More importantly for Madison and the U.S. public was their belief that they had won a war against the mightiest military power on earth. The War of 1812 left many in the U.S. with feelings of patriotism and a belief that they had been selected for greatness. 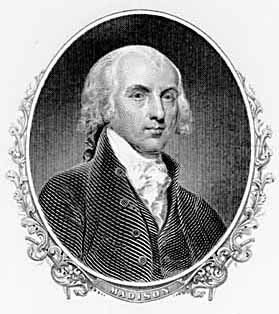 As a result of the War of 1812, President Madison also became a supporter of industrialization, a traditional Federalist policy. The War of 1812 confirmed the United States' political independence from Great Britain, but Madison realized that the United States was still economically tied to trade with Europe. Following his presidential term, Madison retired to Virginia. He remained out of public life other than to help draft a new state constitution for Virginia during the late 1820s. He preferred life at Montpelier, his country estate, and lived the remainder of his life as a gentleman farmer. He died on June 28, 1836.